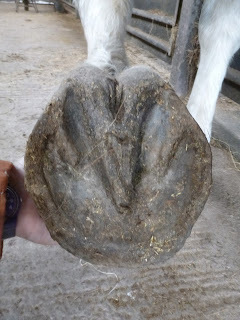 I wanted to post updated photos of Peter because I know both his owner and vet are keen to see what he has been doing over the last couple of weeks. 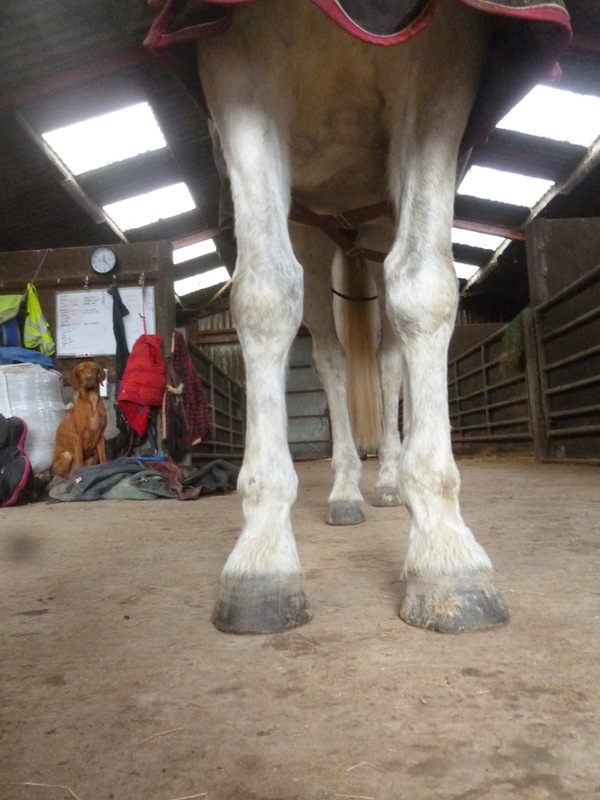 As always, with a horse I haven't seen before he steps off the lorry, its important to set a timeline for initial changes so I normally use the first 4 weeks as a trial period. If we see positive changes, then owner, vet and I can go forward with the rest of the rehab here. Usually, horses begin making changes in the first couple of weeks and though that's only the first step on a long road, its always encouraging to see. With Peter, one of the first things to change has been his stance, which was wide and wacky when he arrived in his remedial shoes. Two weeks later and he is usually happy to stand much more square. At the moment he is looking as if he is toe out but as his medio-lateral balance improves I would expect that to alter. 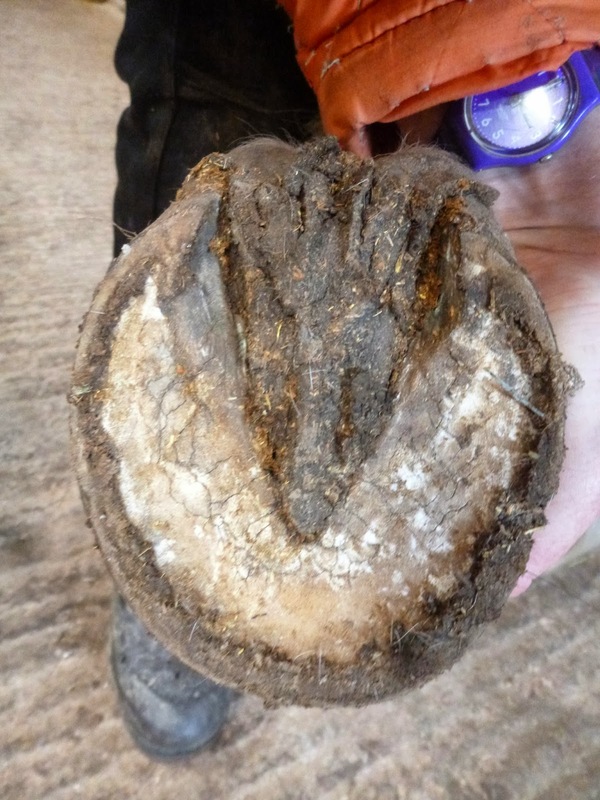 You can see he is already growing hoof at a reasonable rate (compare the nail holes and the ridge just below the hairline in the top photo) and more importantly his heels are if anything less under-run now than they were in his shoes. 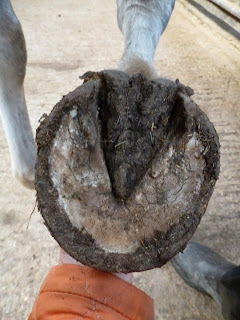 Importantly, Peter is stomping around very happily out of them and its comfortable movement which will make the most difference to him now. This is the same foot the day after his shoes came off and today. The biggest change for now is in the lateral heel which was very unbalanced in the initial shots. Lots of work still to do on his frogs but that should come. Some nice changes starting to happen in his LF though he has a lot to do, of course. Have a great one, and see you later! Isla and Dylan arrived on the same day in September so naturally as Dylan has had his 12 week update Isla is due hers as well. 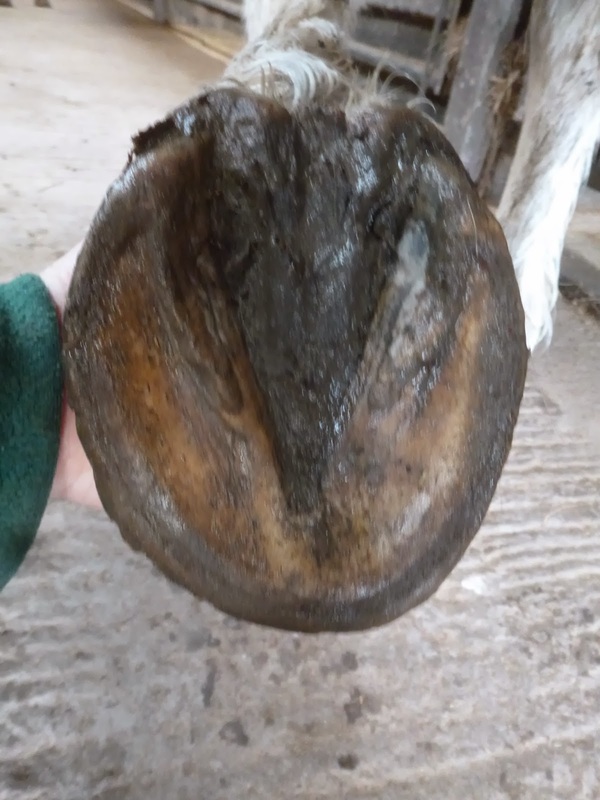 I'm starting with different angles today and palmar shots are always some of the most interesting, I think. On day one Isla had a reasonable foot. She had been out of shoes for several weeks but was landing toe first. She also had a tendency to land on the lateral side of this foot and you can see from this angle that the lateral digital cushion (on the left in this view) is more developed than the right. 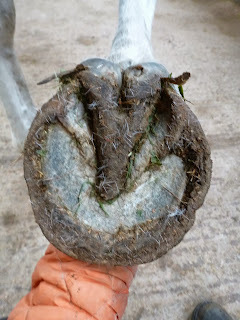 The same foot from the same angle at 12 weeks and its on the way to becoming more symmetrical. 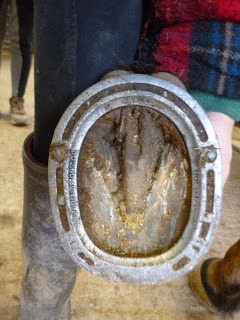 She also has more depth in the back of the foot if you look at the distance from hairline to ground. 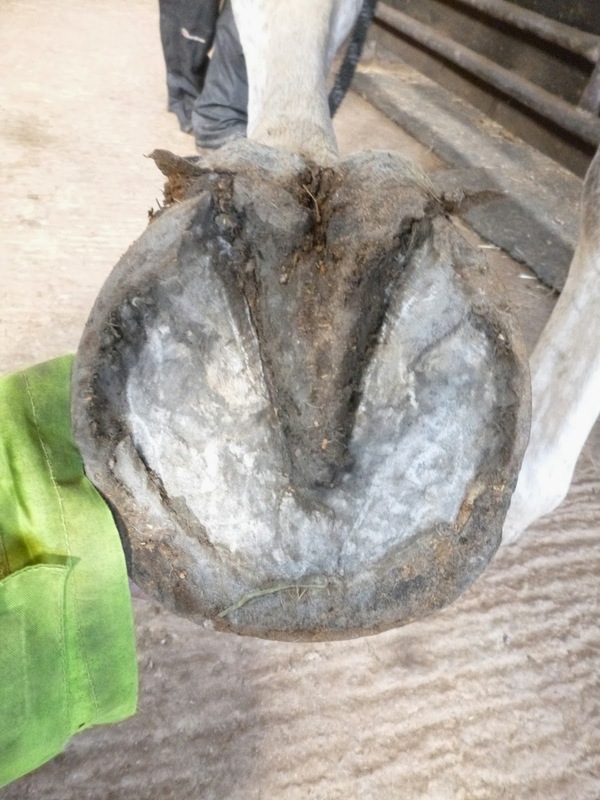 Here is the same foot from the lateral view, confirming the increase in palmar hoof depth. 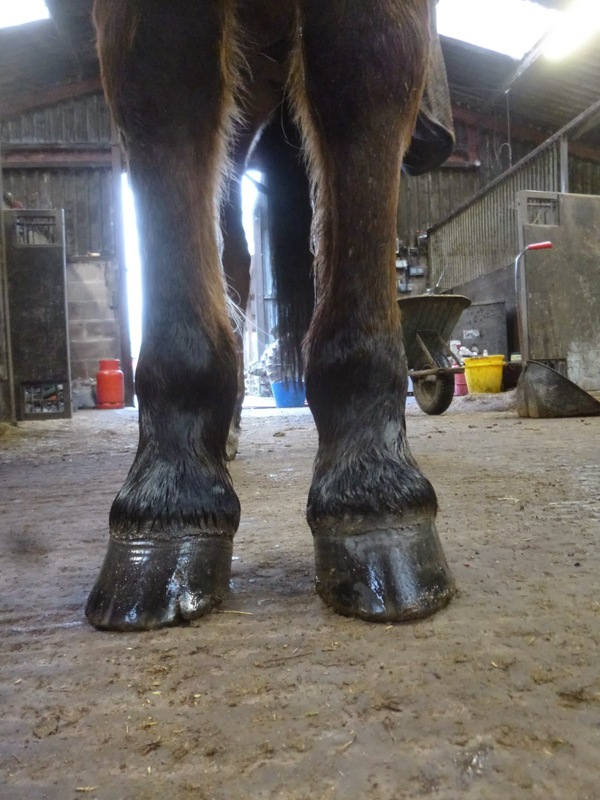 She also has a shorter toe and there are changes in medio-lateral balance too but as always it will be another 3-4 months before she has grown the rest of her new hoof capsule. From the solar view the biggest change is the bigger frog and improved concavity. This foot will look better again once her new hoof capsule is fully grown in as it will shorten her toe and strengthen the palmar hoof even more. More of the same from her right foot, which is good to see, and a clear angle change which will over time allow her a shorter toe and better medio-lateral balance. As with the LF, her right foot has a much bigger frog. The foot looks relatively long in the most recent photo, below, but if you look closely you can see the hint in where she is breaking over now that her toe will shorten considerably once her new hoof has grown in. At the moment the new growth is at the top of the hoof, meaning that what is on the ground is the old hoof capsule but of course that will all change over the next few weeks and months. 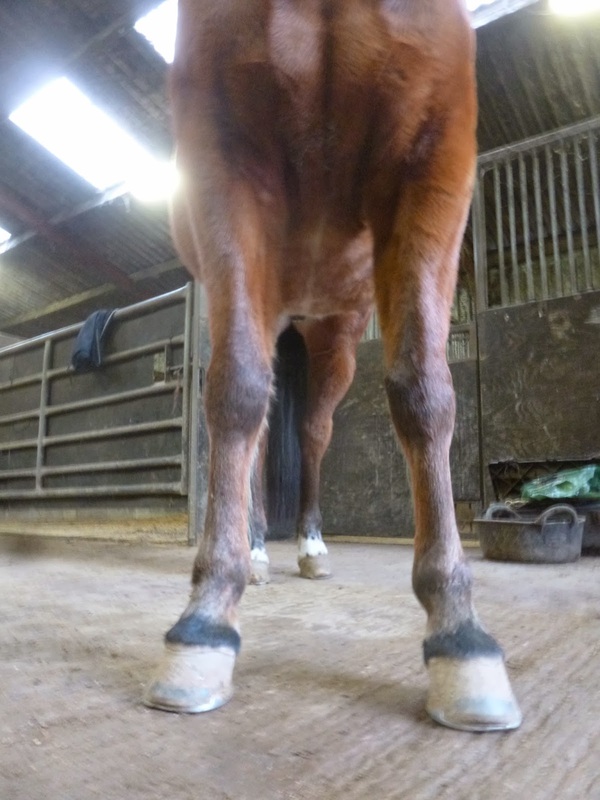 Dylan has now been here 12 weeks and its time for an update. 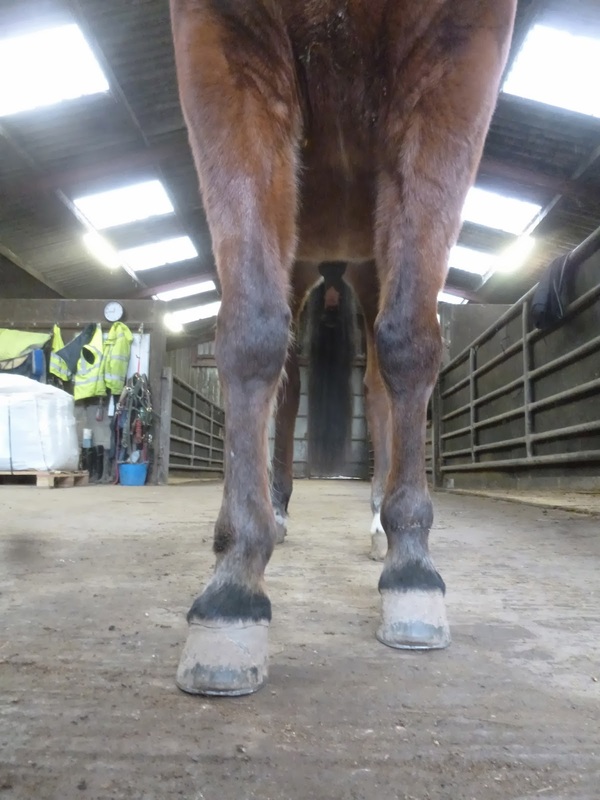 He will be going home next week, still with weak feet which will need many more months of strengthening and rebuilding, but at least heading towards normality. 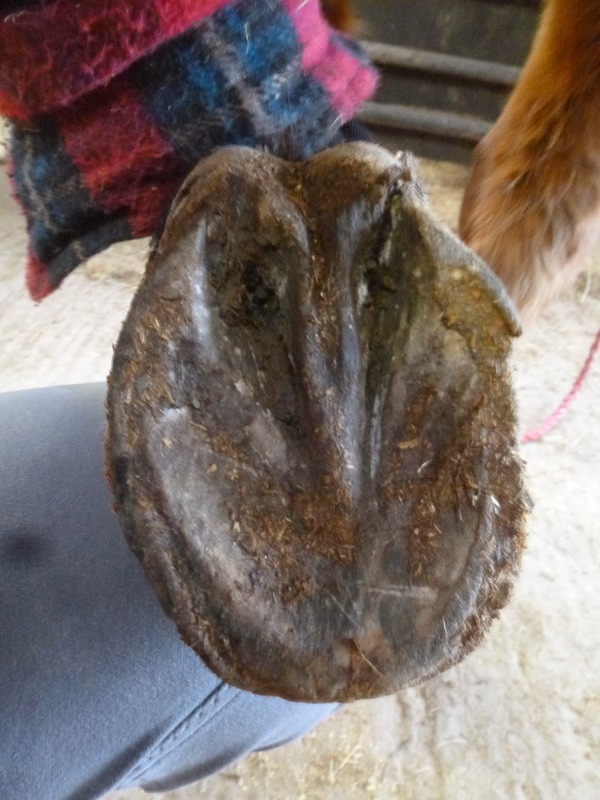 You can see from the profile that this is of course still an under-run hoof. 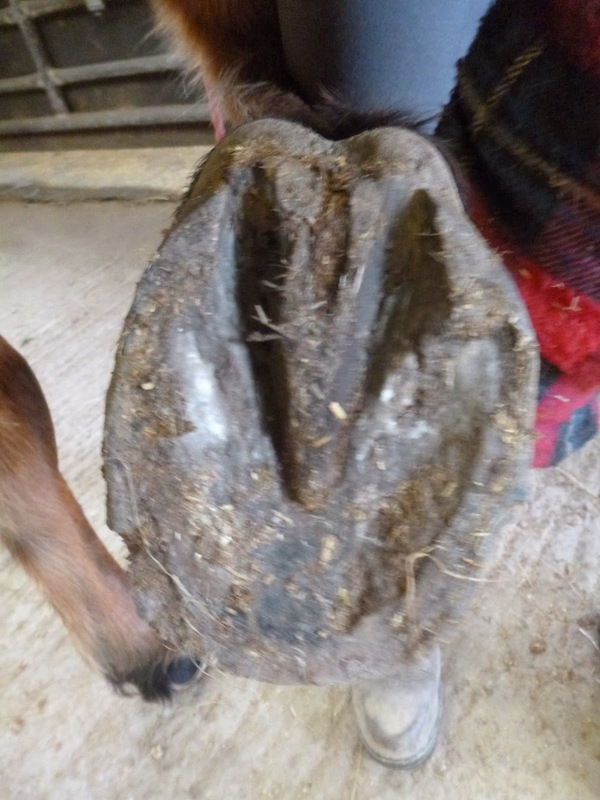 Dylan's feet were so weak that it will take a fair old while for his palmar hoof to repair but for now every step on a stronger hoof is beneficial. Dylan's frogs and digital cushion were compromised at day one and are still weak now. However I would hope that photos from this angle will become stronger over the next few months. 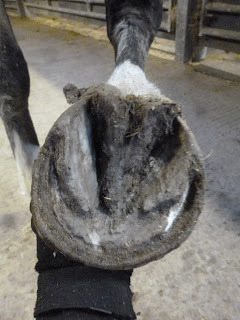 A shorter toe but again a very weak and under-run foot, even today. The hairline is less distorted though so the back of his foot should continue to get stronger going forward. Two pictures of an ugly frog. The lower one is better but there are still so many changes which need to happen. Time is on Dylan's side, however, and patience is going to be required by all of us. 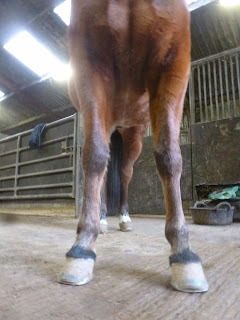 Brigitte - a Dutch warmblood - arrived just over 2 weeks ago and her initial post is here. She'd been out of shoes for a while but on box rest so it was always going to be interesting to see how her feet changed with movement. Already, a big difference in her hoof profile from the lateral view which is very encouraging. There are also big changes in her LF but here there is a severe weak point which you can see highlighted in these photos. 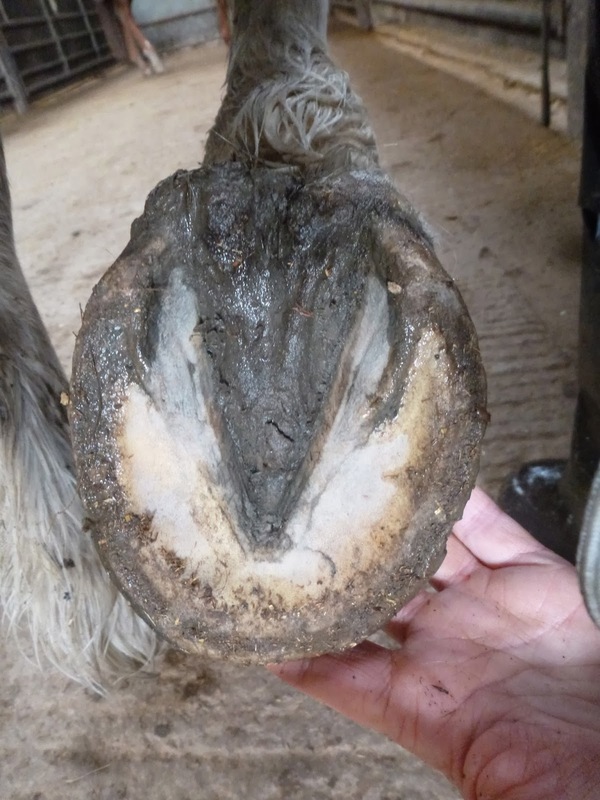 The lower photo shows it most clearly as a line traversing the hoof from the palmar aspect, just where there is a kink below the digital cushion. Over time she should grow this weakness out but it will certainly take a few months for that to happen. 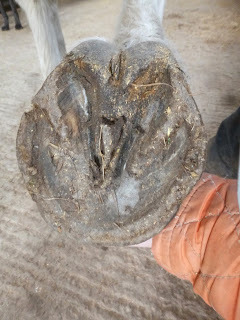 I really like these sole shots and the much more symmetrical picture she is beginning to build. Heels are moving back, the foot is rebalancing and even at this early stage there is lots to be happy about. 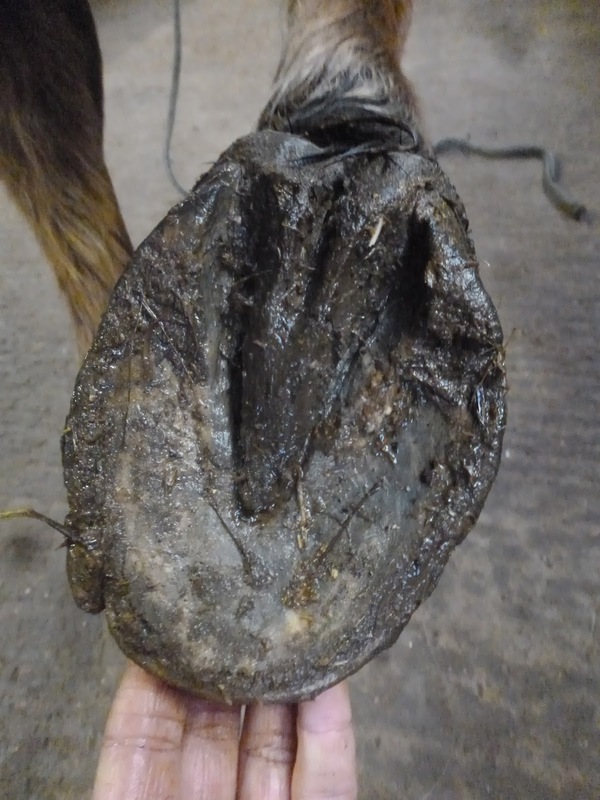 The same story on her RF and from these photos you can also see how the ridge of bar which she came with is starting to disappear as her hoof grows down with a stronger and healthier profile. 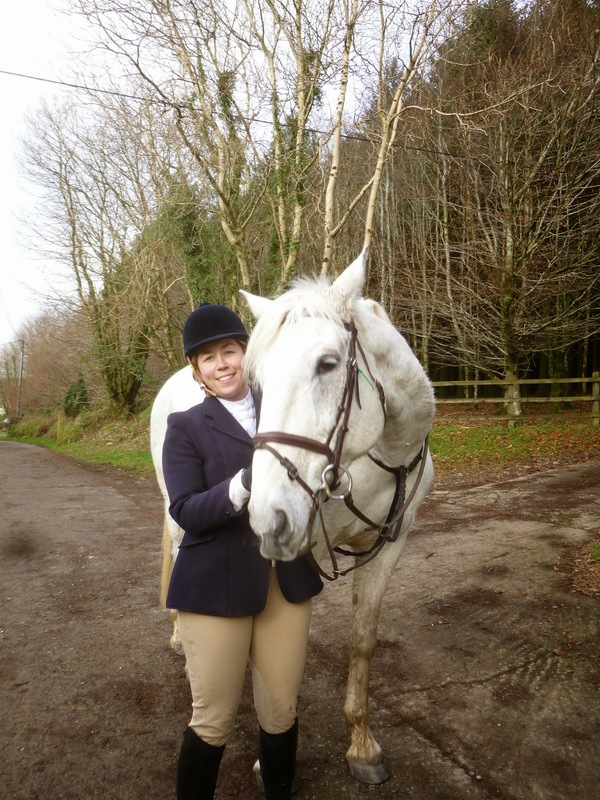 A great first fortnight for Brigitte so fingers crossed for her over the rest of her time here. Indy - whom I blogged about on Friday - has now gone home but we had a special treat in store for his final day. 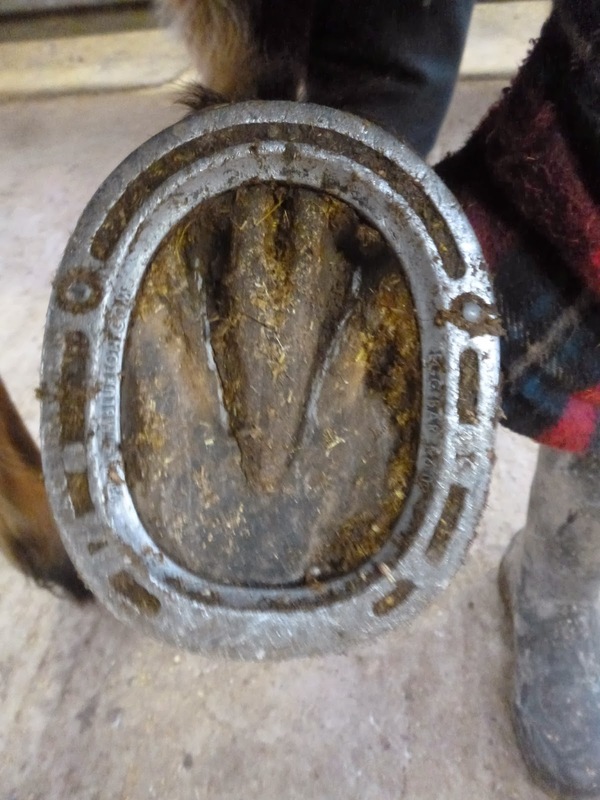 There was a meet on our doorstep and his owner Emily and I were both happy that a short and quiet morning on home ground would not only be well within his capabilities (despite him only being halfway through growing a new hoof) but would also send the pair of them home with smiles on their faces. At first Indy thought we were just all going out exercising on the same old route he had been on countless times before but then he realised that there were lots of extra horses - not to mention a pack of hounds - at the end of the road. Happy days! A very cheerful Indy just after we set off from the meet, even though he wasn't at this stage totally sure what we were all doing. 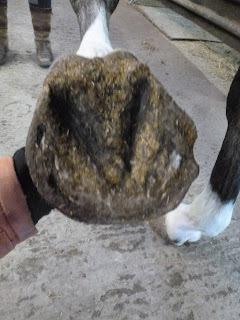 ...but stony tracks weren't much of a problem either and I expect rock-crunching performance from him once he has grown a full new hoof - go Indy! "I am a very clever boy!". Indy is due to go home on Monday after being here for 12 weeks. I will post his clips later but in the meantime got ahead with his photos and there are some interesting points to note. 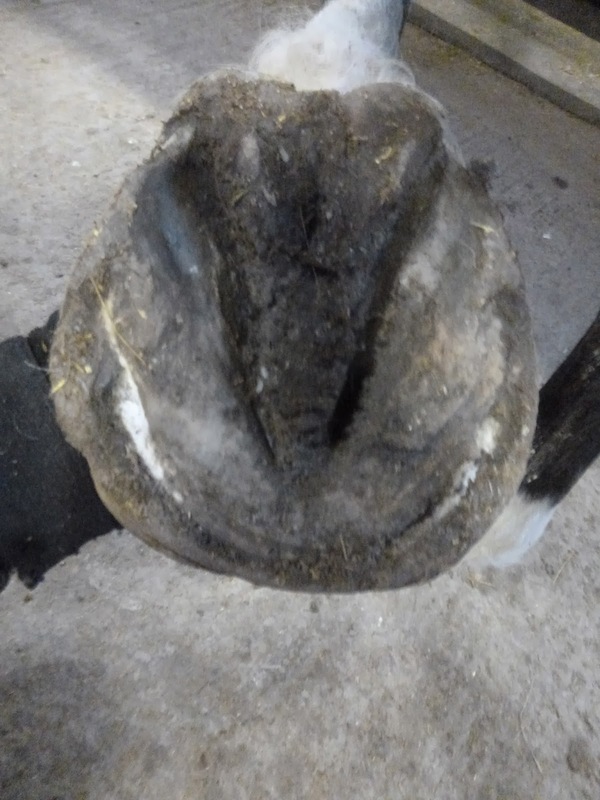 First off, look at the angle of the line at his quarter and how much it has changed over 12 weeks. Along with the shorter toe has come a much more supportive heel (again, check out the angle at the back of the foot) and a straighter hairline. The same story on his RF and so its no surprise that his landing has gone from toe first to heel first as well. 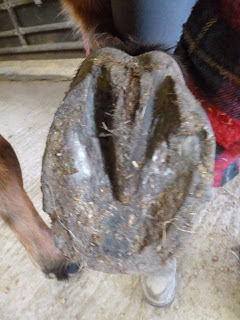 I'll post photos next week showing the change from the palmar angle as that's the most important. For now you get a hint of what is happening even in these lateral shots. 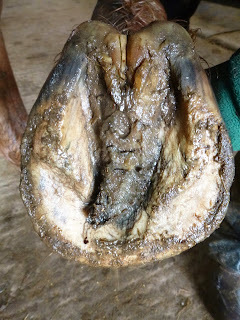 Sole shots also show a healthier frog building and a more symmetrical hoof. The heels and bars still have a way to go but are moving back to a more supportive position. 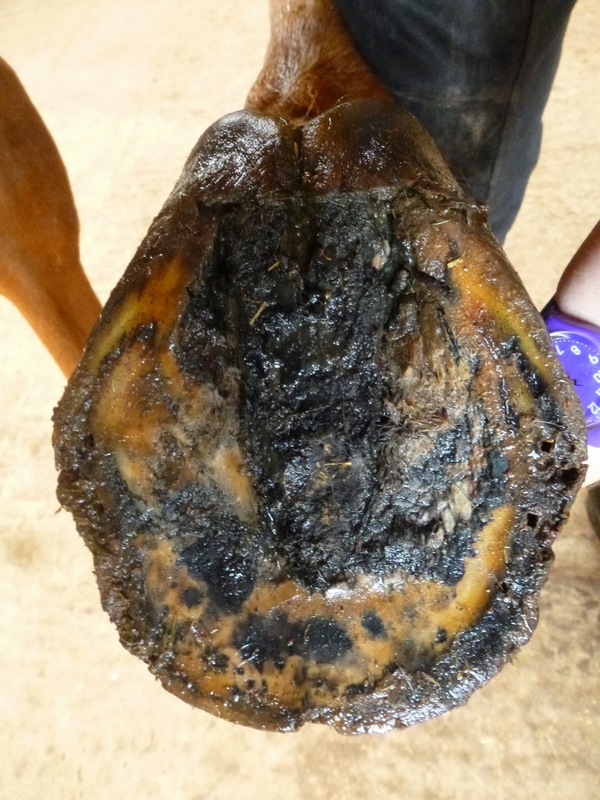 The whole hoof also has more concavity though that's hard to assess just from a photo. Better symmetry and balance are also evident if you compare the week 1 and week 12 photos of his LF. 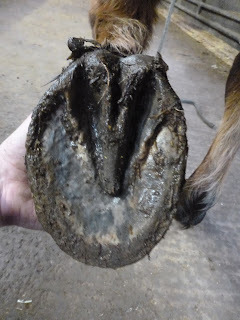 A long way to go before he has the perfect hoof but a good start and a foundation which can be built on. 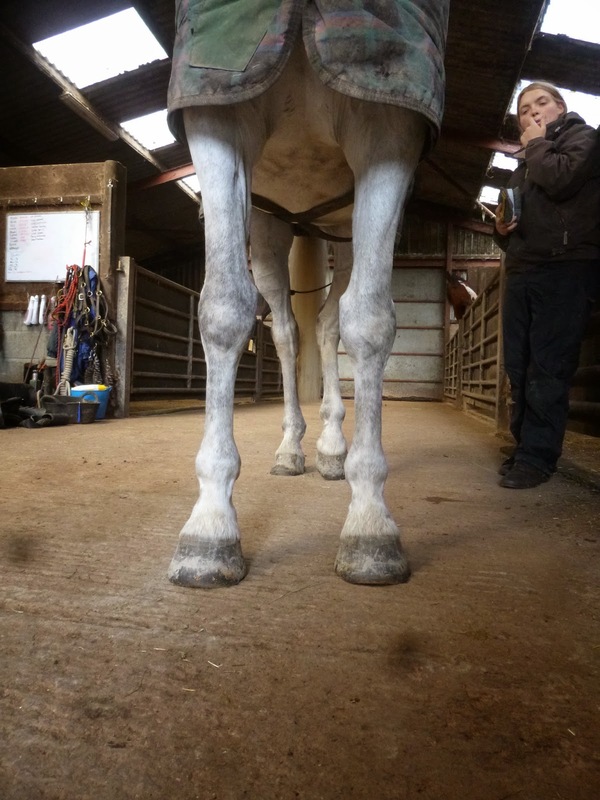 Personally, comparing these photos of his stance over the same period I prefer the lower one, particularly because both front feet are more stable and grounded and there is less stress on the fetlocks and knees. 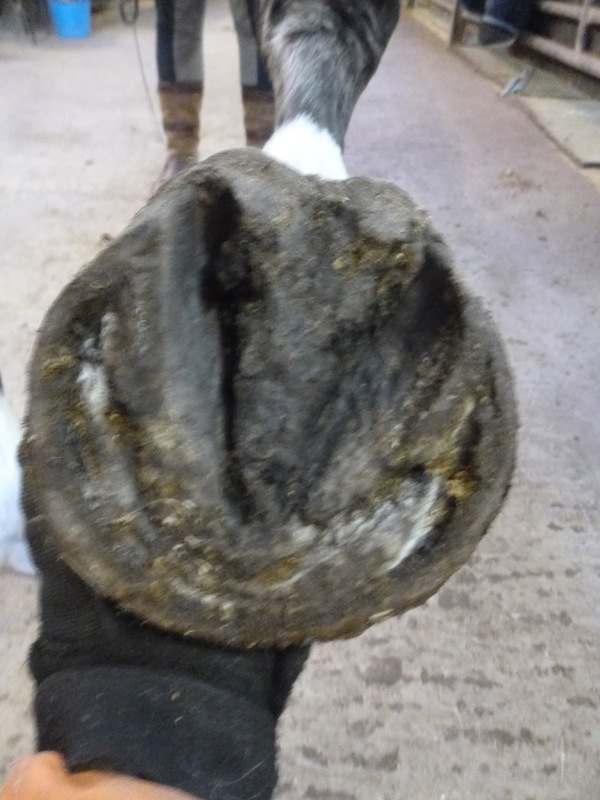 Of course Indy still has half a new hoof capsule still to grow so we should be hoping for some much better feet in another 3-4 months.